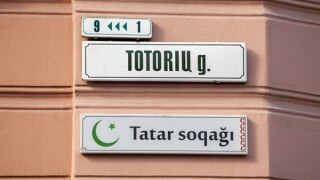 In Vilnius on Totoriu st. on Thursday, 15th September, was unveiled a decorative plaque in Tatar language- not paying attention on appeal of government representative in Vilnius region to take off the symbolic, bilingual plaque from the capital. The council of the capital, in the short time, is going to hang more decorative plaques: on 3rd November- on Vokiečių st, (German) on 20th November – on Žydųst st (Jewish). „For all of us, it is not only the unveiling of a plaque, but a much more important event – symbolic, original street decoration in Tatar language authenticates that Vilnius, is and still will be a friendly and open to everyone city”- said the mayor of Vilnius Remigijus Šimašius. The celebration of the unveiling of a plaque was accompanied by a folkloristic group Ilsu (Matherland). The chairman of Cooperative Union of Lithuanian Tatar Adas Jokubauskas prof.dr, said that the unveiled in Tatar language plaque expresses respect for communities, which for a long time have been living in Vilnius. „Tatars have been living in dense communities in Vilnius since the Grand Duchy of Lithuania period. Next year we will be celebrating the 620th anniversary of Tatars’ arrival to the Grand Duchy of Lithuania”, emphasized. He also reminded, all gathered people, a beautiful history of Tatar street and the beginnings of Tatars’ settlement in Vilnius: hundreds of representatives of this community were living in the suburb of Lukiszka, whereas Tatar street was called this way because, it led to the Tatar Gate, which defence was commissioned to Tatars. According to census from 2011, in Lithuania lived 3,2 thousands of Tatars. Nowadays in Vilnius, there are plaques with the names of streets not only in Lithuanian, but there are also singular in other languages, such as: Icelandic, English, Russian and Polish. They are situated on Rusu st. (Russian), Islandijos st. (Icelandic), Varšuvos st. (Warsaw) and on Vašingtono st. (Washington). All have appeared this year. In short term, the capital council, is going to hang another decorative plaques: on 3rd November –on Vokiečių (German), on 20th November – on Žydų (Jewish). Meanwhile, the representative of the government in Vilnius region, at the beginning of the current week, demanded removal of these plaques, because, according to her opinion plaques in non-Lithuanian language undermine legal acts, which say that public writings should be in national language. Tłumaczenie by Aneta Banacka	w ramach praktyk w Europejskiej Fundacji Praw Człowieka, www.efhr.eu. Translated by Aneta Banacka	within the framework of a traineeship programme of the European Foundation of Human Rights, www.efhr.eu.